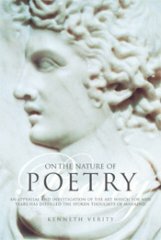 Almost a library in one volume, this unusual book, written by an accomplished poet, examines the 4000 years old phenomenon of poetry. It explains the underlying power of this art form and how its effect is exerted over human hearts and understanding. Over 200 poets from both East and West are quoted. Deeply attracted to the works of Shakespeare and the 4000 years old history of poetry, Kenneth Verity worked as a communications specialist, travelling widely in the Far East, studying Buddhism in Tibet, Thailand and Korea. Verity lectures and broadcasts, and is the author of three books of sonnets and two books of haiku. The author is a man whose books illustrate profound knowledge of his subject; essential for anyone studying the history of this art.